Back Bay Books, 9780316196734, 304pp. "A beautifully written novel about living with our many selves." Anne Korkeakivi was born and raised in New York City but currently lives in Geneva, Switzerland, with her husband, who works at the United Nations, and two daughters. She has also lived in France, Finland, and a number of states in the Union, accumulating a B.A. in Classics and an M.A. in English and Comparative Literature. Her short stories have run in The Yale Review, The Atlantic, The Bellevue Literary Review, and other magazines. "Anne Korkeakivi's writing has all the best qualities of an Ishiguro novel. Clare, a seemingly selfless diplomat's wife, the epitome of restraint and hermetic detachment, unravels before us into a woman of dangerous allegiances, passions, and moral dilemmas, in prose that is both beautiful and razor sharp. Paris is depicted with subtle complexity, a city that reposes as it threatens, full of scorn and grace. Korkeakivi's sense of detail is remarkable while grounded in authenticity. An Unexpected Guest is a feast of a novel." 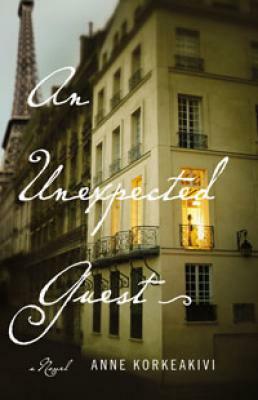 "An Unexpected Guest is a quietly intelligent novel about a woman who, at long last, learns to be honest with herself."